Ragdolls have light body color and darker "points" and always have blue eyes. If you want a cat that is as sweet as it is large, you'll be happy with either the ragdoll or the ragamuffin. Both breeds can top out at 15 pounds and, although there are a number of other similarities between them, the Cat Fancier's Association recognizes them as two distinct breeds. The CFA allows every color and pattern for the ragamuffin including any amount of white, but excluding pointed colors. This is a huge distinction between the ragamuffin and the ragdoll, as the ragdoll breed is exclusively pointed, meaning that the body is a lighter color than the face, legs, tail and ears, although the ragdoll can have white "boots" and "gloves" on its feet and legs. 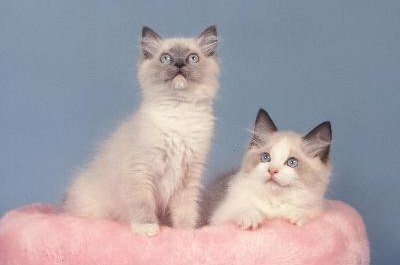 The CFA describes the coats of both breeds as being medium long, with plumed tails but it makes a distinction between them by noting that the ragamuffin's coat does not readily mat, while saying that reduced matting is a characteristic of the ragdoll. The eyes are another feature that is significantly different in the ragamuffin and ragdoll cat breeds. The Cat Fancier's standards state that both cats have large eyes, but the ragamuffin's eyes are a rounder, walnut shape as compared to the oval shape of the ragdoll. The color of the eyes also play a part in distinguishing the two breeds, as ragdolls have only blue eyes while ragamuffins can have any color eyes. Both the ragdoll and ragamuffin breeds are noted for their sweet, affectionate natures. Although the CFA recommends either breed as companions, it does distinguish the ragamuffin breed as being good with children, citing the breed's calm and patient temperament. Both of these breeds were developed, neither naturally occurring, but there is no official history of the development of the ragamuffin breed. Ragdolls, however, are known to have been developed in the 1960s by a cat breeder in California. The breeder, Ann Baker, noted that the kittens from a domestic long-haired white female she acquired had distinctive and endearing personalities. By breeding this female to select cats she owned or found, she developed the ragdoll breed.